Would you like a fried drive with your Windows 7 install, sir? One day I decided to try out Windows 7 public beta. I had a spare 500 gig drive lying around, so I thought I’d put that in my main machine and disconnect the normal 2x 250gb drives which house my day-to-day Vista install. So I hooked up the spare drive, got Windows 7 installed, played around for a little while then got bored with it. After the reflex move of yanking the power cord, I removed the side of the case and extracted one of the drives to find the scene below. 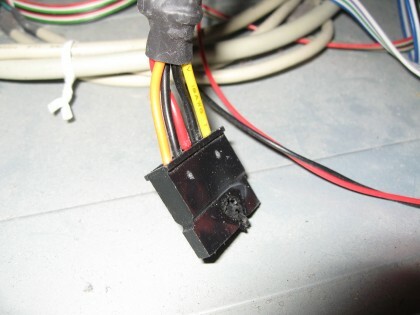 I think there may be a flaw in the design of the SATA power connector, which means that if it’s slightly dislodged then the 5v rail and ground can short out quite spectacularly. And when you have a high-power PSU, the over-current cut-out threshold is set too high so there’s no protection from things like this. 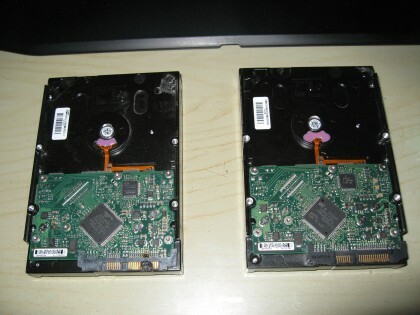 The drive which was damaged is part of a RAID 0 array, meaning that half of the data of my running system was on it. I have 2 independent methods of backup for my main computer: daily file backups of all important files (photos, source code, documents etc.) and a manual perdiodic backup using Norton Ghost. If the worst came to the worst, I should eventually be able to recover all my important stuff and theoretically a complete system image. However, last time I tried to restore from Ghost, the result was very unreliable and had to be dumped. 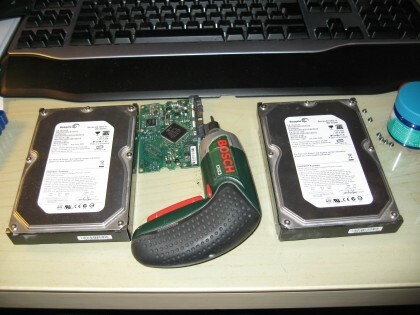 So, before I considered going down the route of backup restores I thought I’d have a go at repairing the drive. 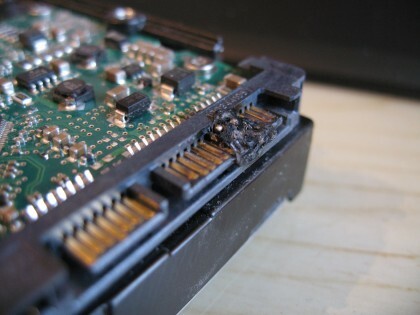 It looked like only the board had become damaged, and at that only the connector and nearby soldering (the copper tracks had melted into balls) was affected. Ebay is your friend when it comes to finding rare parts, so I started there. I needed an exact match to the drive that I was trying to repair, since I needed a controller board which would work with the internal drive mechanics which should still be working fine. The first order was a disappointment. The listing was slightly misleading, as it listed the exact model I wanted but the model I received was an equal size but completely different configuration. The second order wasn’t as bad, but didn’t work. It was manufactured at a different plant, and used slightly different chips and a different firmware version. Although the drive spun up, none of the computers I tried it with would recognise it at all. After wasting a chunk of money, I looked at the corner of my desk and whaddya know … an excact matching drive! Lesson: look around for things hiding in plain sight before wasting money. The matching drive was originally paired with the damaged one, but got replaced when it sounded like it was dying (turned out to be something else). So, swapping the board from the twin drive to the broken one solved the problem. 2 weeks later I had a working machine again. Author killswtchPosted on Tuesday, 3rd March, 2009 Sunday, 29th March, 2009 Categories HardwareTags accident, hard drive, Hardware, repairLeave a comment on Would you like a fried drive with your Windows 7 install, sir?